Spring is the perfect time for lighter fabrics such as linen and silk. It's also a time for renewed life. So, Shibui's newest yarn, Twig, is perfect for your spring knitting. Twig's linen and recycled silk create a light, refreshing look that bends and bows with grace, like new branches in the Spring. It knits up into a beautiful fabric -- soft and cool, with the kind of drape that is effortless. All of these qualities are captured in Mia, an a-line top with a flowing skirt. The drape of the yarn along with the feminine details of the seed stitch and crochet edging form a flattering top. The skirt swings and dances around your hips. 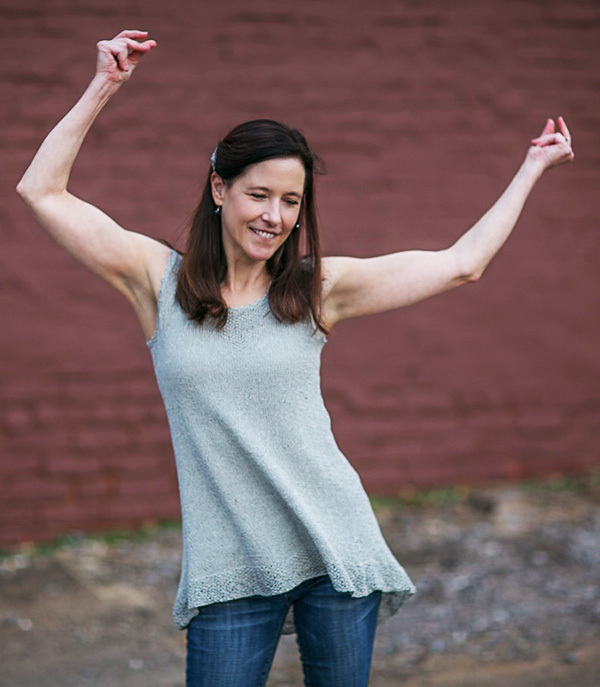 The union of the yarn and design creates a very wearable top that is simply elegant. Mia, a simple elegant name for a simply elegant top. Mia has several origins with varied meanings such as mine, beloved, dear or darling. Once you wear Mia you will be calling it "my dear beloved top!" [MC] Shibui Knits Twig [46% linen, 42% recycled silk, 12% wool; 190 yd per 50g skein]; color: Ash; 4[5, 6, 6, 7, 7, 8, 9, 9, 10] skeins. 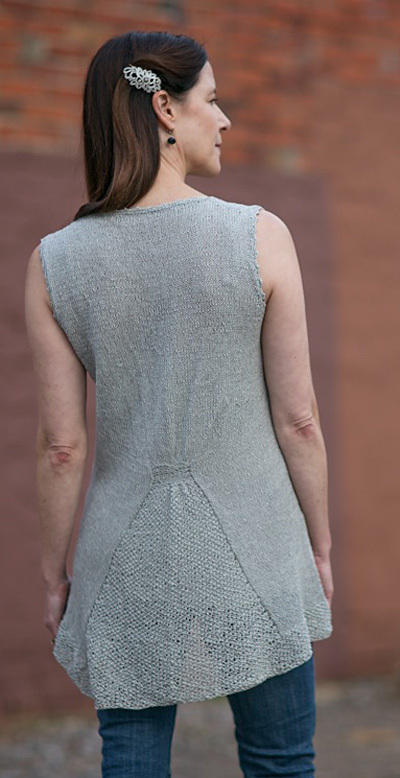 This pullover is constructed from the top down in one piece with short-row shoulder shaping and short rows in the back to make it longer than the front. Body shaping is created by a gather in the back. The top fronts and back are worked flat until they are joined under the arms, then it is worked in the round. If you desire the front and back to be the same length, leave out the Back Short Rows. RLI (Right Lifted Increase): Use the RH needle to pick up the st below the next st on the LH needle. Place it on the LH needle, then knit this new st. 1 st has been increased. LLI (Left Lifted Increase): Use the LH needle to pick up the back of the st 2 rows below st just knitted, then knit this new st. 1 st has been increased. Rnd 1: [K1, p1] to last st, k1. Rnd 2: [P1, k1] to last st, p1. Rnd 1: [K1, p1] to end. Rnd 2: ]P1, k1] to end. Short Rows 1 (RS) & 2: Work to last 13[14, 16, 16, 17, 18, 19, 19, 19, 19] sts, w&t. Short Rows 3 - 6: Work to wrapped st, hide wrap [see stitch guide], work 3[3, 4, 4, 5, 5, 5, 5, 6, 6] sts, w&t. Next Row: Work to the end of the row, hiding last wrap as you come to it. Work even until back measures 6.5[6.25, 6.75, 6.5, 7, 6.5, 6.5, 7, 7, 7] inches from cast-on edge. Repeat these 2 rows 2[3, 3, 4, 4, 6, 7, 7, 9, 10] more times. 79[87, 93, 99, 101, 109, 115, 115, 121, 123] sts. Back measures approximately 7.25[7.25, 7.75, 7.75, 8.5, 8.5, 8.75, 9.25, 9.75, 9.75] inches from cast-on edge. Break yarn and place sts on hold. 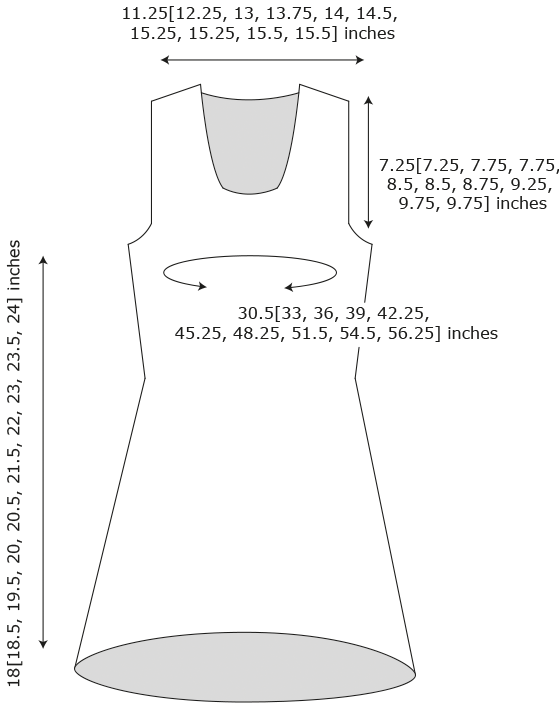 Note: Place a locking marker at each armhole edge to designate start of Front. With Back RS facing, starting at left-most locking marker, pick up and knit 16[18, 20, 21, 22, 23, 24, 24, 24, 24] sts from cast-on edge to end. Short Row 1 (RS): Knit 3[4, 4, 5, 5, 5, 5, 5, 5, 5] sts, w&t. Short Row 2: Purl to end. Short Row 3 & 5: Knit to wrapped st, hide wrap, work 3[3, 4, 4, 5, 5, 5, 5, 6, 6] sts, w&t. Short Row 4 & 6: Purl to end. On the next row hide the remaining wrap as you come to it. Repeat these 4 rows 7[7, 8, 8, 8, 8, 8, 9, 9, 9] more times. 24[26, 29, 30, 31, 32, 33, 34, 34, 34] Left Front sts. Break yarn and place sts on hold. With RS facing, starting at right edge of CO Back sts, pick up and knit 16[18, 20, 21, 22, 23, 24, 24, 24, 24] sts to locking m.
Short Row 1 (RS): Knit to end. Short Row 2: Purl 3[4, 4, 5, 5, 5, 5, 5, 5, 5] sts, w&t. Short Row 3 & 5: Knit to end. Short Row 4 & 6: Purl to wrapped st, hide wrap, work 3[3, 4, 4, 5, 5, 5, 5, 6, 6] sts, w&t. After last turn knit to the last st, LLI, k1. Work 3 rows even hiding the last wrap as you come to it. Repeat these 4 rows 6[6, 7, 7, 7, 7, 7, 8, 8, 8] more times. 24[26, 29, 30, 31, 32, 33, 34, 34, 34] Right Front sts. Joining Row (RS): Knit across Right Front sts, pm for Seed Stitch, CO 25[27, 27, 29, 29, 31, 33, 31, 33, 33] sts, pm, knit across Left Front sts. 73[79, 85, 89, 91, 95, 99, 99, 101, 101] Front sts. Next Row (WS): Purl to Seed St m, work in Seed Stitch to next m, purl to end. Next Row (RS): Knit to Seed St m, remove m, k1, pm, work in Seed Stitch to 1 st before m, move m 1 st to the right, knit to end. Repeat these 2 rows 2[1, 1, 0, 2, 0, 0, 0, 0, 0] more times. Work 1 more WS row. Body Inc Row (RS): K1, RLI, knit to m, remove m k1, pm, work in Seed Stitch to 1 st before m, move m 1 st to the right, knit to last st, LLI, k1. Next Row (WS): Purl to m, work in Seed Stitch to next m, purl to end. Repeat these 2 rows 2[3, 3, 4, 4, 6, 7, 7, 9, 10] more times. 79[87, 93, 99, 101, 109, 115, 115, 121, 123] Front sts. Note: Switch to Seed Stitch in the round for the Seed Stitch section on the Front. Join for working in the rnd (RS): Knit to m, remove m, k1, pm, work in Seed Stitch to 1 st before m, move m 1 st to the right, knit to end of Front. CO 20[20, 24, 28, 36, 38, 42, 52, 56, 62] sts, placing a side marker in the middle of these sts. Join Back sts and knit to end. CO 20[20, 24, 28, 36, 38, 42, 52, 56, 62] sts, placing a side marker in the middle of these sts. This is the new beg of rnd marker. 198[214, 234, 254, 274, 294, 314, 334, 354, 370] Body sts. Next Rnd: Knit to Seed Stitch m, work Seed Stitch to next m, knit to end. Seed Stitch Rnd: Knit to Seed Stitch m, remove m k1, pm, work in Seed Stitch to 1 st before m, move m 1 st to the right, knit to end. Repeat these 2 rnds 4[5, 5, 6, 4, 5, 5, 4, 3, 2] more times. Work in Stockinette Stitch until body measures 3.5[4, 4.5, 5, 5.5, 6, 6.5, 7, 7.5, 8] inches from under arm, or until 2.75 inches above desired length for gather. Set-up Rnd: Knit to side m, k29[32, 36, 40, 45, 49, 53, 58, 62, 66] sts, pm for Back Shaping, k41[43, 45, 47, 47, 49, 51, 51, 53, 53] sts, pm for Back Shaping, knit to end. Short Row 1 (RS): Work to second Back Shaping m, k5, w&t. Short Row 2 (WS): Work to second Back Shaping m, p5, w&t. Short Rows 3-20: Work to wrapped st, hide wrap, work 3 (4, 4, 5, 6, 7, 8, 9, 10, 11) sts, w&t. After last turn knit to end of rnd, hiding wraps from last short row as you come to them. Set-up Rnd: Knit to first Back Shaping m, remove m, k7[8, 7, 8, 6, 7, 6, 6, 5, 5], pm for Back Gather (BG); k27[27, 31, 31, 35, 35, 39, 39, 43, 43] sts and pm for Back Gather (BG); knit to end. Next Rnd (Dec): Knit to BG m, sl m, p1, [ssp] 6[6, 7, 7, 8, 8, 9, 9, 10, 10] times, p1, [p2tog] 6[6, 7, 7, 8, 8, 9, 9, 10, 10] times, p1, sl m, knit to end. 15[15, 17, 17, 19, 19, 21, 21, 23, 23] BG sts. Next Rnd (Dec): Knit to BG m, sl m, p1, [p2tog] 3[3, 3, 3, 4, 4, 4, 4, 5, 5] times, p1[1, 3, 3, 1, 1, 3, 3, 1, 1], [p2tog] 3[3, 3, 3, 4, 4, 4, 4, 5, 5] times, p1, sl m, knit to end. 9[9, 11, 11, 11, 11, 13, 13, 13, 13] BG sts. Next Rnd: Knit to BG m, purl to next m, knit to end. Repeat this rnd 5 more times. Next Rnd (Inc): Knit to BG m, sl m, p1, [p1f&b] 3[3, 4, 4, 4, 4, 5, 5, 5, 5] times, p1, [p1f&b] 3[3, 4, 4, 4, 4, 5, 5, 5, 5] times, p1, sl m, knit to end. 15[15, 19, 19, 19, 19, 23, 23, 23, 23] BG sts. Next Rnd (Inc): Knit to BG m, sl m, p1, [p1f&b] 6[6, 8, 8, 8, 8, 10, 10, 10, 10] times, p1, [p1f&b] 6[6, 8, 8, 8, 8, 10, 10, 10, 10] times, p1, sl m, knit to end. 27[27, 35, 35, 35, 35, 43, 43, 43, 43] BG sts. Even Rnd: Knit to BG m, p1, work in Seed Stitch to 1 st before next, p1, knit to end. Repeat this rnd 2 more times. Work 3 rnds even incorporating new sts into Seed Stitch pattern. Work even in patt until 2 inches short of desired length. Set-up Rnd: Knit to BG m (this is the new beginning of rnd). Next Rnd: Work in Seed Stitch throughout, removing other m(s) as you come to them. Work in Seed Stitch until Seed Stitch border measures 2 inches or until desired length. BO in pattern with larger needle. With RS facing and crochet hook, starting at right back neck, working right to left, work 1 rnd of single crochet (sc) around entire neckline, working 1 sc for every CO st, and 6 sc for every 7 rows. Picot Rnd: *1 sc into next st, chain 2, sc into chain 2 down from hook, 2 sc into next sc, skip 2 sc, repeat from * to end, slip st into 1st sc to join. Fasten off. With RS facing and crochet hook, starting at underarm CO, working right to left, work 1 rnd of single crochet (sc) around entire neckline, working 1 sc for every CO st, and 6 sc for every 7 rows. Picot Rnd: *1sc into next st, chain 2, sc into chain 2 down from hook, 2 sc into next sc, skip 2 sc, repeat from * to end, slip st into 1st sc to join. Fasten off. Jennifer Wood lives with her ever-growing family in the beautiful foothills of eastern Tennessee. She taught herself to knit 15 years ago and loved it so much she began designing her own patterns. It has been wonderful outlet for her creative energy. 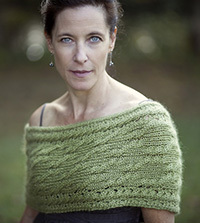 She is creator and owner of Wood House Knits. Her patterns can be found on her website and on Ravelry.